Royal Air Force Cosford is easy to find by road, it is located just off the A41, approximately 1 mile south of junction 3 of the M54. If you wish to use Satellite Navigation to find your way to the Air Show, please use the postcode TF11 8UP, but do follow the Air Show direction signs as you approach the airfield as there will be a local traffic plan in place. Car parking is on grass, although there are a limited number of spaces on hard standing reserved for disabled drivers. For more information regarding disabled parking please visit the Accessibility page. There is a limited amount of off-base car parking to the North East of the airfield. Our traffic management team will adapt to the conditions and flows on the day, so we can never guarantee where cars will be parked. However, the majority of vehicles coming from the East and South will be on base, and those coming from the West and North will be equally split between on and off base. Please note that those parked in the off-base car park are likely to benefit from a speedier entry and exit than those on base. The RAF Cosford Air Show is highly accessible by rail. There is a comprehensive network surrounding us and Cosford station is adjacent to the airfield only two hundred metres from all of the action. We are currently working with the three train operators that service the Cosford station to ensure that we provide as much rail capacity as we can on the day. 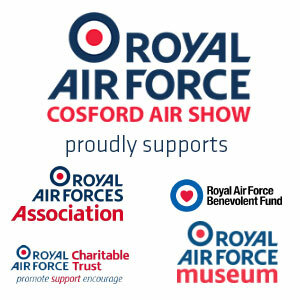 On Air Show day additional train services will be operating to and from Cosford. Vintage Trains are offering a way to travel to the Air Show in style behind their flagship steam locomotive and freshly overhauled No. 7029 ‘Clun Castle’ in period carriages. Departing from Solihull, Dorridge, Warwick Parkway, Coventry and Birmingham International. If you wish to travel by bike or motorbike, there is a dedicated parking area. You will be directed to this on your arrival. Travelling to the Air Show in a taxi or any service where you expect to be dropped off is not advised as the roads into the show become a one-way system and vehicles are unable to turn around and leave until the police reverse the traffic flow which is usually after lunchtime. Please either disembark on the A41 and walk the last 500 yards down or find alternative means of travel. Travelling by coach is an affordable and easy way to travel to the RAF Cosford Air Show. We have formed partnerships with a variety of group travel organisers and coach operators across the country. There are some exclusive prices and discounts that may be available from your local provider. Visit the Coaches section to find an operator near you. There is a park and fly helicopter shuttle from Wolverhampton Halfpenny Green Airport to the Air Show. To book, click here.